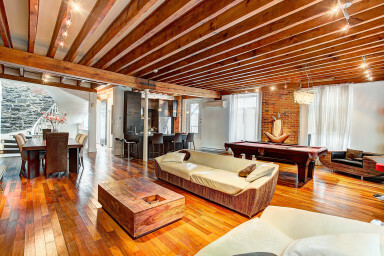 With its exposed wood beams, brick walls and winding stairs, this luxurious loft-style apartment has huge cachet. It’s spread out on two floors, with a stylish open-concept living area on the bottom floor and two bedrooms plus a generously proportioned bathroom upstairs. Comfortable modern furnishings complement the historic architecture beautifully, for a space where you can make yourself at home. Cook up a storm in the fully equipped kitchen, share a meal at the six-person dining table, challenge your friends and family at the pool table, relax in the soaker tub, or catch up on your favourite shows on the smart TV—this space comes with everything you need to unwind and have a good time. A little piece of Canadian heritage to call home! This elegant neoclassical building was designed by architect George Browne and constructed in 1854 on a lot owned by merchant Joseph Knapp. Over the years, it has housed many important companies, including Montreal Telegraph, and has since been renovated into luxury apartments. This historic neighbourhood with its Old-World charm is also a hotspot of contemporary culture. Just up the street is DHC/ART, where you can visit world-class contemporary art exhibitions for free. Around the corner you’ll find the Phi Centre, a multidisciplinary arts centre featuring film screenings, virtual reality exhibitions and other cutting-edge cultural activities. Also check out Centaur Theatre for award winning plays staged in a converted 1903 stock exchange building.